We've got plenty of news on upcoming gadgets and gizmos today, courtesy of our friends at TechRadar: read on for updates about a new Pixelbook from Google, a new Note 9 phone from Samsung, and some important software updates for Apple's HomePod. The official launch of the Galaxy Note 9 is still some two-and-a-bit weeks away, but the first leaked unboxing video is now online – if you don't mind a few spoilers ahead of the Samsung event, you can check it out now. Much of the design matches previous leaks, and a separate picture hitting the web today shows the phone in a deep sea blue shade too. It really is the week for Samsung leaks, and thanks to a listing mistakenly published on a phone accessory retailer site, we know Samsung is prepping a Wireless Charger Duo pad. It's going to be able to juice up two phones at once, or a phone and a smartwatch, and looks to be about to beat Apple's similar AirPower wireless charging pad to the market. Sony has unveiled a new IMX586 stacked CMOS image sensor that is the world's first 48-megapixel mobile snapper. Add in the industry-leading pixel size of 0.8μm and this sensor should be capable of capturing some fantastic snaps in future Sony smartphones – plus phones from any other manufacturers wanting to take advantage of the new tech. We know that a Google hardware refresh is coming later this year, and apparently that refresh is going to include a brand new Pixelbook. 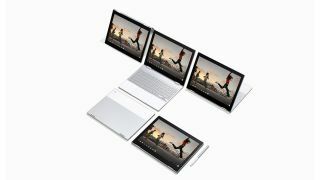 Well-respected tipster Evan Blass says the new Pixelbook is going to feature slimmer display bezels, and will be out before the end of the year – alongside some new Google Pixel phones and a Google Pixel smartwatch. The word on the Apple street is that the company is about to roll out some pretty significant updates for its HomePod speaker – including the ability to make and receive calls right from the device. As per reports, we're also going to see improved translation features and the ability to track your iPhone in a software update arriving later this year.